The Judiciary of Honduras, along with the team implementing the National Service of Judicial Facilitators (SNFJ) will present a report on the progress of this service during the National Judicial Facilitators meeting today [August 8] with Secretary of the Organization of American States (OAS), Luis Almagro Lemes. 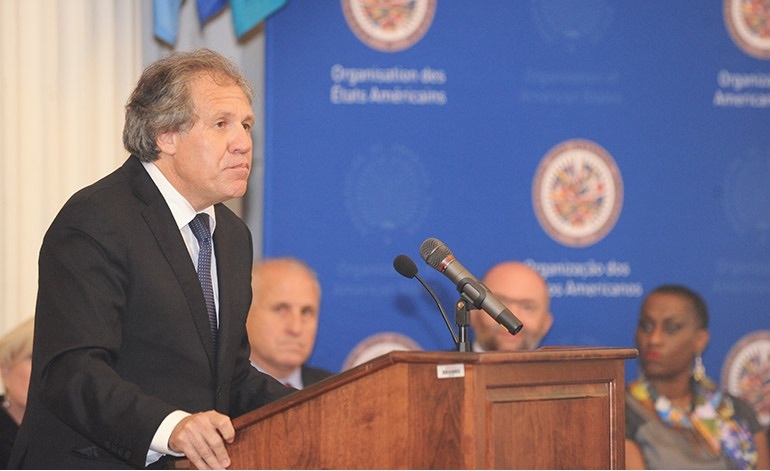 The authorities of this branch of government will inform the Secretary General of the OAS, Luis Almagro Lemes, about the progress, achievements and implementation of the work of this important service that already concerns 12 departments. The SNFJ national meeting will be attended by President of the Judiciary, Jorge Alberto Rivera Avilés; President of the Republic, Juan Orlando Hernández, Secretary General of the OAS, Luis Almagro Lemes, and Pedro Buscovitz, regional coordinator of the Inter-American Judicial Facilitators Program of the OAS. The judiciary through its National Facilitators Service meets objective number 4 of its law, by involving the population in this program. Since 2012 this program has sworn in a total of 1,644 judicial facilitators in the 12 departments where their work contributes to the country’s system of administration of justice. The judicial facilitators are community leaders appointed and elected by the community. They serve as a support to the magistrates in each municipality, which saves time and money for the society and contributes to building a culture of peace. The tasks performed by Judicial Facilitators are: reconciliation, accompaniments, lectures and advice, under supervision by the judiciary and national laws.